We’re excited to announce that Deluxe copies of INTO TOMORROW have sold out in less than three weeks. We’d like to thank our Genesis subscribers and Paul Weller’s loyal fans for their support in the creation of his signed limited edition. Don’t worry if you have missed out on the Deluxe books (numbered 1-350) as Collector copies will be available to pre-order soon. Register your details below to be the first to receive updates. INTO TOMORROW is a visual chronicle of Paul Weller’s solo career, with photographs from Lawrence Watson and text from both authors. Over 300 images are showcased in this large-format, hand-bound tome. Designed to be treasured for a lifetime, each book is housed in a folding solander box and comes with a limited edition vinyl recording. 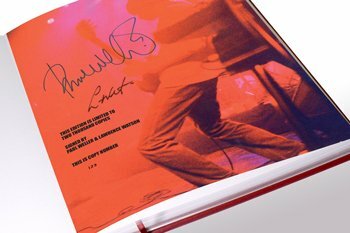 Paul Weller and Lawrence Watson are signing every book in the edition of 2,000 copies worldwide.